Bumkins Divided Plates make mealtime fun for self-feeding toddlers. The divided plate is perfectly sized for kids’ portions. Shatter-resistant, it can handle mighty toddlers! Plus, our Melamine Divided plates are BPA-free. Great for use on highchair trays or tables. Stackable – easy to wash and store 2 or 3! Dishwasher-safe. Not recommended for microwave use. Measures 8.5”W x 9.75”L and .5” deep. Designed in Arizona, responsibly made in China. 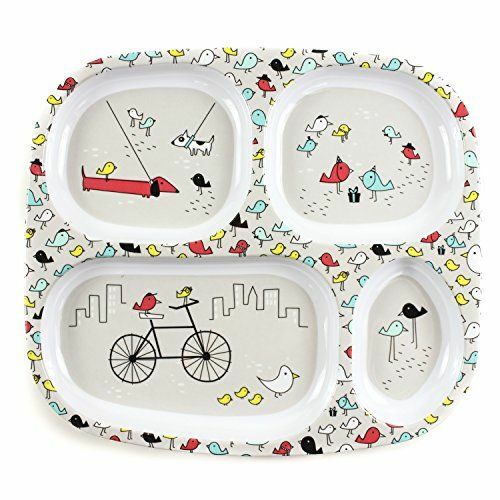 SELF FEEDING – Bumkins Divided Plates make mealtime fun for self-feeding. The divided plate is perfectly sized for kids’ portions. DURABLE – Melamine is shatter-resistant-it can handle mighty toddlers! LAB TESTED FOOD SAFE – At Bumkins, we take pride in our rigorous product testing to ensure you have the safest possible products. CONVENIENT – Great for use on highchair trays or tables. Stackable – easy to wash and store 2 or 3! EASY-TO-CLEAN – Hand wash or dishwasher safe. Perfect so far! So far it is perfect! The size is great for my three year old that likes his food in separate categories. We have wash and have never put it in the microwave. The images aren’t stickers (like some toddler plates) and hold up well to washing and soaking in hot water. It’s been dropped a few times and hasn’t cracked, split, or broken at all.